I’ve been fixing flat tires a few too many times lately. As in three times in one week. More often than not, the punctures were caused by staples like these. I have pulled entire “fresh” staples out of my tires. After staples have been on the road for a while they look like this. The latest rash of staple-induced flats got me thinking. I had many punctures while riding in Houston and Den Haag, but none of those were caused by staples. Broken glass, sharp flints and stones, and thorns – yes. But not staples. Do Malaysian roads have an unusually high proportion of staples mixed in with the other road debris? I received 42 responses. The table below shows the number of times each option was ranked as the most frequent cause of punctures. Two respondents did not indicate a top cause of punctures. 30.00% of respondents ranked Staples or other wire as the number 1 cause of punctures. 22.50% of respondents ranked Pinch flats as the number 1 cause of punctures. 22.50% of respondents ranked Glass as the number 1 cause of punctures. 33 of the respondents live in Malaysia. 3 live in North America. 2 live in The Netherlands. 2 live in Australia / New Zealand. 1 lives in The United Kingdom. And 1 lives in another Asian country. 2 out of the 3 North American respondents ranked Staples or other wire as the number 1 cause of punctures. The other North American rated Staples or other wire as the second most frequent cause of punctures. So perhaps I was just lucky to avoid staples when I lived and rode in the United States. Interestingly, both of the Dutch respondents ranked Staples or other wire as the least frequent cause of punctures. Which matches my own experience over more than two years of cycling in The Netherlands. The sample size is small, and the methodology is not scientific by any means. Nevertheless, this survey does show that Malaysian cyclists suffer more punctures due to staples or other wire (usually fragments of steel wire from failed car and truck tires) than from any other cause. I don’t know why there are so many staples on Malaysian roads. Perhaps stapled paper, being light, gets blown out of rubbish trucks and onto the road. I do know that some Malaysians have the atrocious habit of tossing rubbish out of their moving cars. Which has to be the explanation for the most unusual cause of a puncture reported by a Malaysian cyclist. A chicken bone. Other causes of punctures reported by respondents were variations on pinch flats – hitting a pothole, drain grille etc. (4), faulty valve stems (2), worn or misaligned rim tape (2), old inner tubes (2), nails or screws (2) and overheating by being left in a car under a hot sun. I have my share of pinch flats too. My fault for not checking my tire pressures before every ride. There’s not much I can do about the staples and other debris on the roads, apart from staying off the road shoulders as much as possible. Perhaps it is time to consider an old-school device – a tire saver / tire wiper. Posted in Cycling in Malaysia and tagged Causes, Flat tire, Glass, Nails, Pinch flats, Puncture, Staples, Wire. Bookmark the permalink. A flat tire. What a buzzkill! On rare occasions inner tubes have manufacturing defects. This causes tubes to split along a seam, or tear at the junction with the valve. There is not much you can do to prevent inner tube failures. 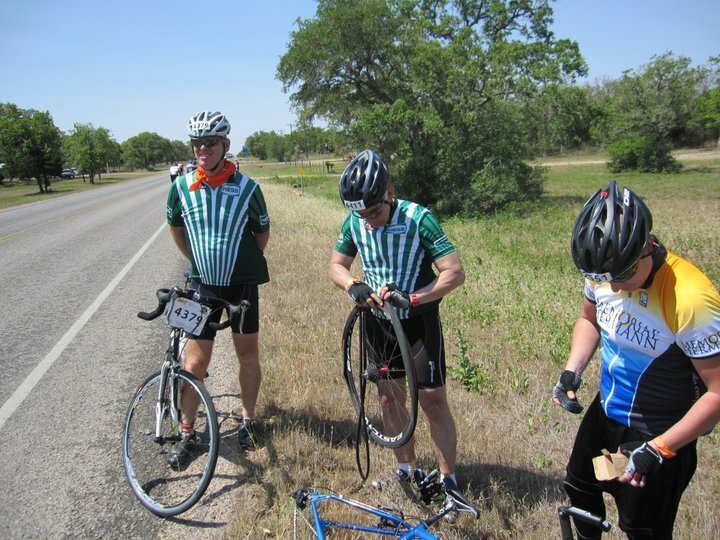 A self-inflicted inner tube failure is the pinch flat, also known as a snake bite. A pinch flat most commonly occurs when you run over something that causes the tire to deform enough that the inner tube is squashed against the wheel rim. This puts two small holes in the inner tube, at the pinch points. I said ‘self inflicted’ because pinch flats are much more likely to occur with under-inflated tires. Bike tires leak over time. You will need to add more air from time-to-time to maintain the proper pressure. Run your tires too soft, and you will be snake bit. I have been guilty of doing this. I like to run my tires at between 80psi and 90psi. Softer tires means a more comfortable ride. I have let my tires get too soft, with predictable results. In most cases flats happen because you ran over something sharp. Roads are littered with sharp objects. Bits of glass, either from broken bottles or shattered windscreens, are usually visible. If you see it in time, you can avoid running over glass. Unless you are riding at night, which is when I picked up this chunk. Small stones are less visible. It is worth examining your tires after every ride to remove any sharp stones stuck in the tread. Before they work their way through the tire and into the inner tube. Then there are the pointy things which are invisible while you are riding. So small that a thorough search is often needed before you find the offending object, embedded in your tire. The majority of my flats are caused by staples or Michelin wire. Those fine bits of steel wire on the right come from steel-belted radial tires, which were invented by Monsieur Michelin. Hence the name. Given that most flat tires are caused by essentially invisible road debris. there is little you can do to avoid them. Even “puncture proof” tires are not 100% resistant to being pierced by staples, Michelin wire and the like. So learn how to repair a flat tire, and carry tire levers, a spare tube, and a pump or CO2 inflator on your rides. And be thankful that we don’t have these in Malaysia. Posted in Cycling in Malaysia and tagged Flat tire, Glass, Inflator, Inner tube, Michelin wire, Pinch Flat, Puncture, Snake bite, Staple. Bookmark the permalink. After more than four years of fall-free cycling, not counting the tumbles I took when I first started using clipless pedals, I have had two crashes in as many months. The first is described in Oh 🔥💀💣💩⚡!! I was lucky to come away from that crash with only two injuries of note. The bruise on my upper thigh turned into a haematoma that needed draining twice before it healed into a lump of scar tissue. What I thought was a slightly separated shoulder turned out to be a rotator cuff injury. I had some pain and restricted movement of the left arm, but nothing that required me to stop riding. “What about the bike” you ask? My bike had only two injuries of note as well. A broken right shifter and brake, and a front rim that needed to be trued. Both of which were expertly repaired by Husher and his crew at Meng Thai Bicycle Centre. Since that crash I did a lot of rides, including the Shah Alam Enduride 2014, the Klang Premiere Century Ride 2014, and the Kuantan Century Ride 2014. All without incident. There was no reason to expect that the climb from Kuala Kubu Bahru to Fraser’s Hill and back would be any different. The first time I did the Fraser’s Hill ride was in February 2013. I was looking forward to seeing if my revised hydration regimen would get me to the top in better shape than I was the first time. All went well on the way up. I was able to hold a faster average speed, and did get to the clock tower without cramping this time. My rear tire had a slow leak after our stop for coffee at the stall at the Gap. The 8 kilometers from the Gap to the clock tower is the steepest part of the climb. I elected to make a couple of stops to pump more air into the tire, rather than change the tube whilst in a sweaty mess. I swapped tubes at the top before we made the final short climb to the food court for lunch. A piece of fine wire that looked like it came from a casing or a car of truck tire was the culprit. All was going well on the way down. The food court is at 1,290 meters above sea level. The Gap is at 860 meters above sea level. 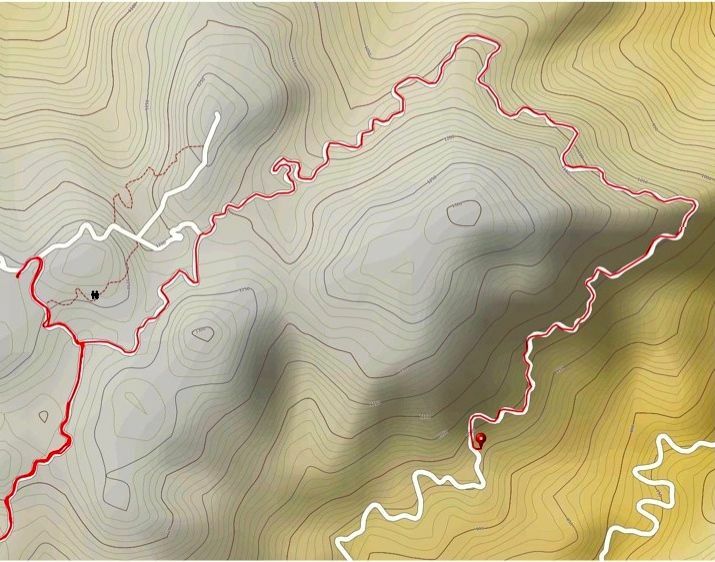 The road between the two is 12 kilometers of descending delight. Lots of sweeping curves, but with a few tight ones as well. Riders have to stay alert for the tight turns, and areas where the road surface is less than optimal. I made it down to 995 meters. As I came into a left-hand turn at 50kph my front tire gave out. Perhaps I had picked up a piece of that fine wire in the front as well. I’ll never know. I do know I had that “Oh 🔥💀💣💩⚡ ! !” moment before I started preparing as well as I could for the inevitable crash. There are lots of articles on the web about how to fall off your bike. These are the things they all tell you. Wear a helmet. Excellent advice. This is what my helmet looked like after the crash. Much better the helmet cracked rather than my head. All I had was a slight bruise on my right temple. Wear your cycling gloves. Gloves will provide some protection for your hands. I wasn’t wearing gloves. I didn’t scrape my hands because I did the following three things. Choose your surface. I did not want to fall onto the tarmac. As my bike started sliding I worked to stay upright long enough to get to the side of the road. I managed to feather my braking so my tires kept rolling rather than sliding out from under me. I also tried to steer so that I was as parallel as possible to the curb. The last thing I remember seeing before impact was the concrete curb and open drain that I was flying over. And that I was going to land on the grassy verge. Don’t lock your elbows and knees. I fell on head and right shoulder first. Grass and mud were jammed into the large ventilation slot on the right side of my helmet, and there was a grass stain on my right shoulder. The rest of my jersey was unmarked. Oddly enough my first thought was that I had broken my left arm. My upper arm hurt the most. A quick check showed that my left arm was intact. As were my other limbs and my collar bones. I didn’t land on my hands. I had no cuts or scrapes on my elbows or knees. I had scratches on my calves, which I can only assume came from my lower legs running through a thorny plant. I assume that I rolled on impact, which dissipated some of the force of the crash. Tuck your head. This is to protect your neck. I must admit this must have been an unconscious reflex. Or I was lucky not to land on my face. 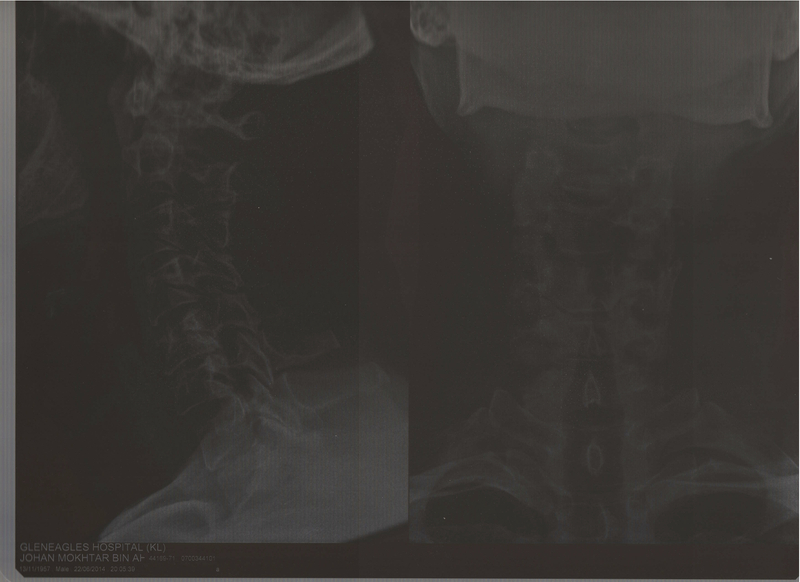 My neck is intact, but as you can see from the x-ray of the back of my neck, the vertebrae weren’t exactly in a straight line. Practice falling. This is the last piece of advice from the web. I think I have practiced enough. The outcome of this 50kph shunt was that my upper back was incredibly sore for a week. I sprained every muscle in my neck and shoulder blades. I also aggravated the rotator cuff injury. So I have a limited range of motion in my left shoulder. I also severely compressed the nerves leading from my neck to my left arm. That was the cause of the burning pain in my upper arm at the time of the crash. 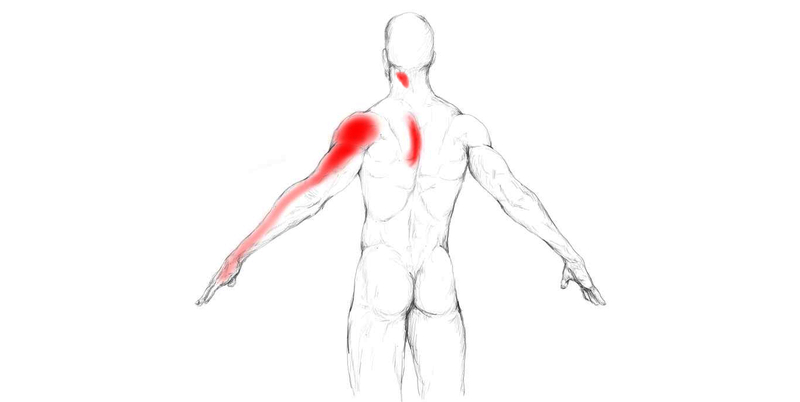 I have ongoing numbness and tingling in my left hand, weakness in that arm, and pain in the areas illustrated below. The short-term outcome of my visit to the orthopedic surgeon is a collection of pills. 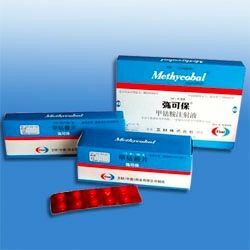 Methycobal. 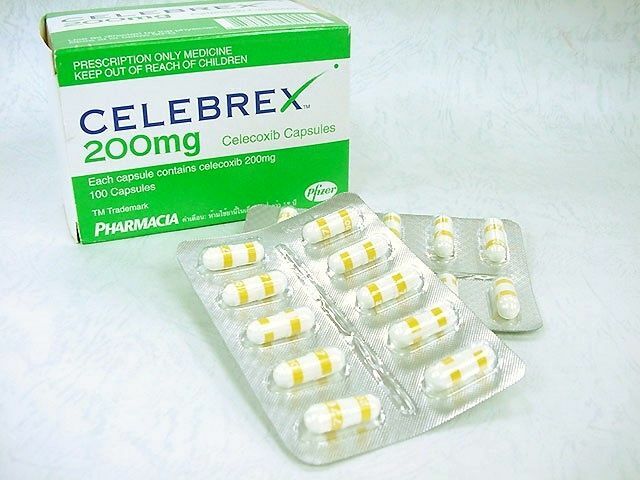 500mg three times a day, to help with nerve repair. Myonal. 50mg three times a day to help relax muscles which are spasmodic. Celebrex. 200mg twice a day to combat inflammation. Ultracet. 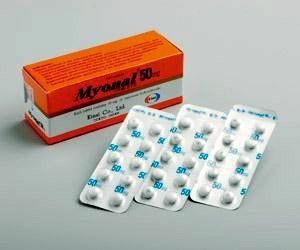 375mg three times a day to combat pain. 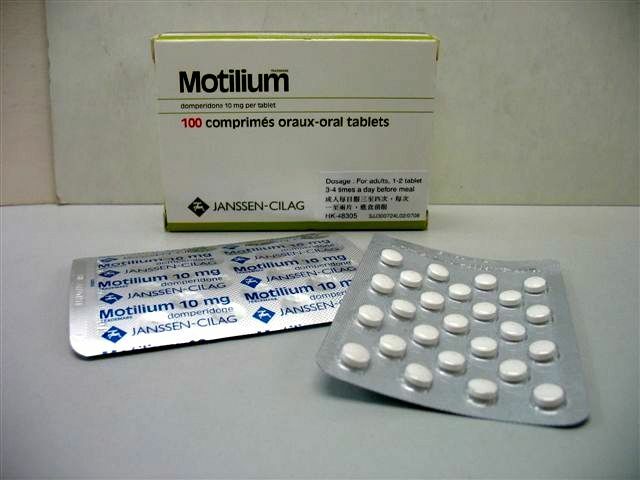 Motilium. 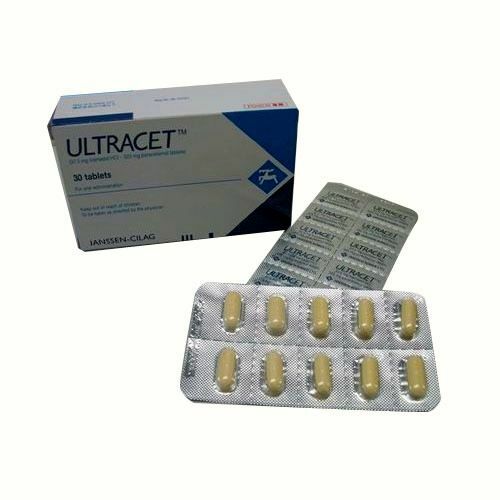 10mg three times a day to combat nausea caused by the Ultracet. The longer-term outcome is physiotherapy three times per week. This includes decompression of the vertebrae in my neck through traction, and treatment of the rotator cuff injury with laser, ultrasound and electrotherapy. 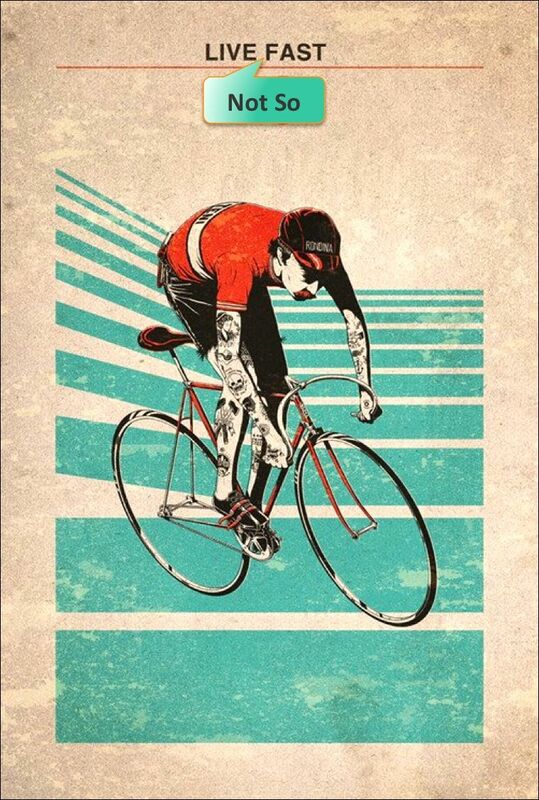 And perhaps most painful of all – no bike riding until the injuries heal. It could have been much, much worse though. I could have crashed on the valley side of the road and fallen who knows how far down the side of the hill. I could have hit a tree, or a guard rail, or a electricity pole. I could have crashed on the tarmac. On my face. I was very, very lucky. Hence the title of this post. A Yiddish saying that I now firmly believe in. After my last crash I resolved to ‘Look Forward’ whenever I am on a bike. After this crash I added a second mantra . . .
“What about the bike” you ask? No damage to the bike, apart from some scratches on the left front fork. How does that Yiddish saying go again? Posted in Cycling in Malaysia and tagged Crash, Flat tire, Fraser's Hill, Helmet, Meng Thai Bicycle Centre, Shoulder. Bookmark the permalink. I must have been dropped on my head as a baby. My aborted first ride with the Six Thirty group should have been my cue to stick to gentle solo rides along the Columbia Tap Rail to Trail. Instead, at the very next opportunity, I planted myself, clad in Cordura and polyester, amongst the others resplendent in their Coolmax and Lycra, outside West End Bicycles. This time toward the front of the group in the hope that it was not possible to be overtaken by everyone behind me before the first traffic light. 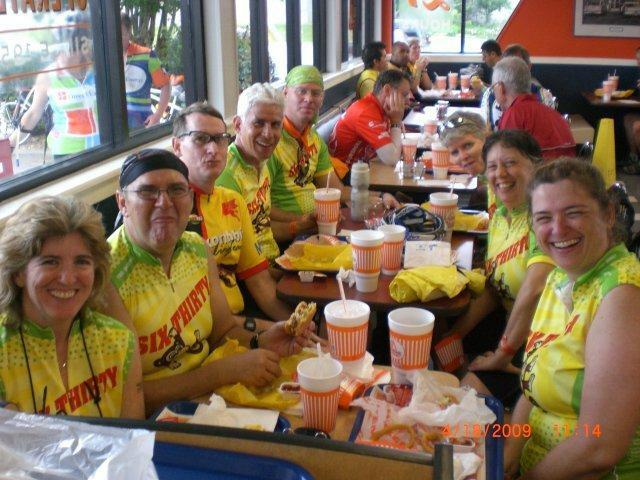 This photograph of some of the group was taken many many rides later, after I had swallowed the red pill and was worthy of wearing the Six Thirty jersey. Alisa K. is second from the right. Tom B., who features later in this post, is third from the left. Most of the group did get past me by the first traffic light. But not everyone. Call it competitiveness or plain bull-headedness but I stayed ahead of a few other riders. If I was going to get lost again I was determined to have company. Apart from the constant struggle to keep the group ahead of me in sight I don’t remember much about the 18 km / 11 mi to the old Houston Scottish Rite Temple on Brompton Street. I was just glad that it was getting easier to see the flashing rear lights ahead of me as it got darker and darker. What a relief it was to get to the midpoint of the route and to see the gaggle of faster riders who had stopped to wait for slowpokes like myself to catch up. Naturally the stronger riders, having had a rest and a chat while waiting, were raring to get going again. Red tail lights twinkled off into the distance as I leaned over my handlebars, struggling for breath and wondering if the hammering in my ears would ever stop. Pounding heart or not, I had to start riding again. I didn’t know the way back to the bike shop. To get home I had to keep the group in view. I pushed down on my pedals and bumped and clunked along for a few metres. I had my first ever flat tire. A feeling of dread descended upon me. I was up the proverbial creek without a paddle. I was in total darkness and had just a small headlight that provided minimal illumination. I had never changed a flat tire before. Which was irrelevant because I didn’t have any tools or a spare inner tube. The prospect of having a flat tire had never occurred to me. Neither had the notion that I would ever need to call for help to get home. As I was trying to figure out the name of the street that I was on I heard a voice say “Are you okay?” Tom B. appeared out of the gloom. I don’t remember hearing it but he must have been accompanied by the sound of angelic harp music. Tom changed my inner tube for me and guided me back to the bike shop. A kindness for which I remain eternally grateful. He is a very dear friend to this day. I was at West End Bicycles the very next morning to buy inner tubes and tools both for myself and to replace what Tom had used to get me back on the road. Before I rode again I practiced taking a wheel off and replacing the inner tube. And I am happy to say that I have had opportunities since then to make my own contributions to good bicycle karma by helping other new cyclists who unexpectedly find themselves unprepared to fix a flat. Posted in Cycling in Texas and tagged Coolmax, Flat tire, Houston, Inner tube, Karma, Lycra, Six Thirty, West End Bicycles. Bookmark the permalink.